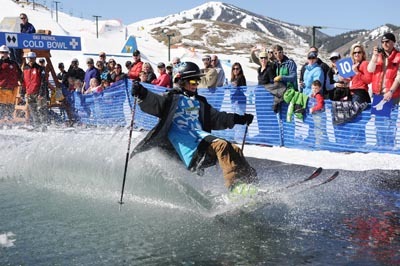 Skier Wilder Curtis, 13, glides across the “Cold Bowl” pond Sunday at the base of Dollar Mountain during Sun Valley Resort’s annual Dollar Dayz celebration to mark the end of the ski season at the family-oriented ski area. Pond skimming is a spring tradition at many ski resorts in which costumed skiers and snowboarders gain a burst of speed and try to cross a chilly pond on their boards. More than 200 competitors and 1,000 spectators attended Sunday’s spectacle. The pond was 85 feet long and 16 feet wide and held 30,000 gallons—close to 250,000 pounds—of 36-degree water. Who should pay for frozen pipes? Saturday’s dilemma is: folk or country? Ketchum or Hailey?